By buying this product you can collect up to 40 points . Your cart will total 40 points that can be converted into a voucher of ₱40 . It's easy to be passionate about winning, but at Logitech, our passion is in the science that makes winning possible. We build precise gaming instruments. We advance technology so gamers can reach new levels of speed, precision, reliability and comfort. Science is our philosophy, our methodology for studying, testing, and advancing gamers' experience—in the lab and in the game. Wireless freedom for the top of your game. For gamers who know there is no such thing as “over-prepared”, the G700s is a must-have. Precise? Check. Customizable? 13 programmable buttons will perform complex macros at your command. Full-speed wireless? With the lightning-fast report rate of a wired gaming mouse, you won’t believe it’s not plugged in. And with a single quick-connect data/recharging cable, you can seamlessly switch to a powered connection for non-stop gaming. 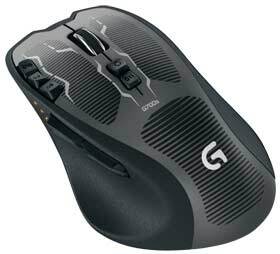 Whether you're taking down MMO raid bosses, or leading an FPS squad to victory, the G700s gives you epic performance. 2. Tested on popular gaming mousepad surfaces. 3. Tested on wood-veneer desktop.